In this morning’s Hedgeye email, Keith McCullough discusses how the S&P 500 is ultimately due for a correction. 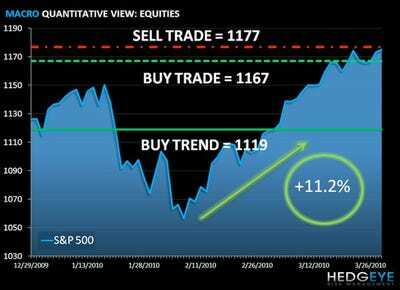 The bull rally of recent weeks has been impressive, squeezing shorts hard and making people lots of money but alas, McCullough does not agree with it, saying that if lower volume and past performance are anything to consider, this trend won’t last forever, as demonstrated by the chart showcasing 2009’s performance. Hedgeye: In the last 2 weeks, I have largely missed these short squeeze rallies to higher-highs in the SP500. I missed making money on them in last part of 2007 too. This time, the volume is a lot lower (both actual market volume and the daily yip-yap of who is going to be LBO’d next), but things I am seeing and hearing out there are starting to rhyme. 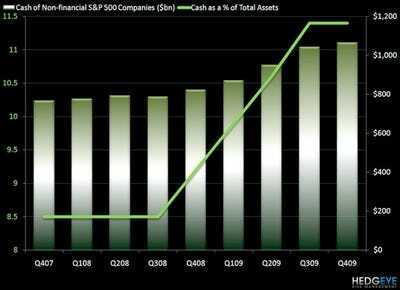 I won’t remind you who those were that used to parrot that “the world is awash with liquidity” in 2007, but I will show you a chart that A) isn’t new and B) gets emailed to me at this point every other day. This is one way the perpetual bulls are trying to justify chasing this rally up here – the “cash on the sidelines.” Yes, there is a lot of it. But there was with the SP500 -74% lower too. The second chart shows you the Pain Trade since the February 8th lows. By any historical analysis of SP500 price performance, a +11.2% melt-up in over a 7-week timeline is not normal. Some people are calling this a complacency rally. I disagree – I think it’s a Fear Rally at this point. There is outright fear of either being short squeezed or redeemed for missing another massive move higher. This fear factor is usually most prominent at month and quarter ends (Wednesday). I’m not calling for a 2008 style crash, yet. But I am calling for another correction.